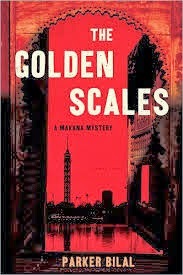 Parker Bilal's first crime novel, The Golden Scales, languished on my tbr pile for the past year, until I saw a review of the 2nd novel in the series, which sent me back to the pile. Turned out to be a good decision. Bilal is a pseudonym for literary novelist Jamal Mahjoub, whose other work delves into cultural conflicts of various sorts, apparently. His new crime series, featuring Makana, an ex-cop from Sudan now working as a private detective in Cairo (in the years prior to the recent Egyptian revolution and coup). The Golden Scales starts with a large coincidence, linking a preface that shows us an Englishwoman in 1981 who is desperately looking for her daughter, lost in Cairo. The novel proper begins in 1998, when Makana (whose private detective business is more than a little less than succesful) is hired by a prominent Egyptian developer (with a criminal background) to find the missing star of the football team he owns. The coincidence is Makana's brief encounter with the same Englishwoman, back in Cairo and still searching for her daughter. Makana begins (as these things go in crime fiction) to see links between the missing footballer and the Englishwoman. To say much more about the plot would involve spoilers, so I'll confine myself to more general comments. The novel is written in a direct style, in the third person, mostly from Makana's point of view. There are some flashbacks to the sad story that caused Makana's flight to Egypt, and the whole pattern of stories provides a rich overlay of conflicting cultures, the topic of the author's other novels as well. But the crime story is not being condescended to. Though the story develops somewhat slowly, and over a fairly large number of pages (almost 400), the book remains lively and involving throughout. The complexities of Egypt of the late '90s is particularly interesting, given the more recent events. 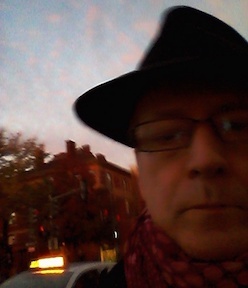 But the story is at base (like many noir novels) one of unhappy families, rich and poor.